No, not the preservative BHT, but Bacon, Herb and Tomato. I needed to use up some leftover odds and ends of various breads that were languishing in the fridge - Afghan bread, baguette, and Tuscan bread (it was too late for the multi-grain boule). The garden is still producing tomatoes, but at a more comfortable pace, and the herbs are spilling over the edges of the paths. Fry 4 slices of bacon in a large skillet. Cut leftover bread into largish bite-sized pieces - say, 1" cubes. Slice 2 cloves of garlic thickly. Remove the bacon to a plate, and spoon off most of the bacon fat. Pour olive oil into the skillet to replace the bacon fat. Think about this for a while. Saute the garlic and bread cubes until the bread is toasty and crunchy, but the centers of the cubes are still soft. Season to taste with salt and pepper. Pour the contents of the skillet into a large bowl (a much larger bowl than you think you'll need). Dice as many ripe tomatoes as will give you a salad that's mostly bread, but with plenty of tomatoes. Chop coarsely a mixture of herbs. I used basil, cinnamon basil, red basil, lemon basil, parsley, sweet marjoram and 'Zaatar', but very small amounts of the last two. Add the tomatoes, herbs, and crumbled bacon to the bread cubes in the bowl. Toss everything together, taste and add salt, pepper, and/or olive oil, as needed. Eat immediately! Before it gets soggy. This little experiment exceeded my fondest hopes - really good Thai food at home. I noticed there weren't too many ripe tomatoes in the vegetable patch, but chile (chilli?) peppers were abundant and the basil needed to be cut back. Hmmmm, chiles and basil, chiles and basil....oh yeah....pork with chiles and basil! But I didn't have all my cookbooks with me in the country, so I'd have to improvise. Checking Chez Pim for inspiration, I found a stir-fry made with nam-prik pao, which is made with dried chiles and shallots and shrimp paste - all things I didn't have. So I made a paste consisting of 1 'Pinocchio's Nose' pepper, several (3?) 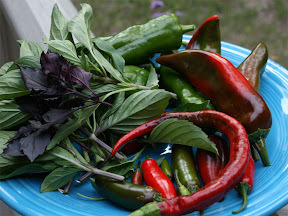 'Serrano Tampiqueno' peppers, 1 'Czechoslovakian Black' pepper, 1 'Bellingrath Gardens Hot Purple' pepper, 4 medium cloves of garlic, and the lower stems of some basil sprigs (the basil tops get added later). All the peppers were the reddest, ripest ones I could find. I chopped all this as finely as possible (not quite a paste) using an electric mini-chopper. I sliced 3 thin-cut boneless pork chops, several New Mexico-type peppers, and part of a red onion (lengthwise) into thin strips. Now we're ready to cook. I heated some oil in a large non-stick saute pan. When it was hot I added the chile paste and fried it for a short time (until the whole house smelled of chile and garlic). The I added the sliced peppers and onions, and 4 'Bellingrath Gardens Hot Purple' peppers (whole, but crushed with the flat side of a chef's knife). I stirred the vegetables around for a minute or so, and then added the sliced pork. Kept cooking and stirring just until all the pork pieces looked cooked. Then I added several splashes of fish sauce, tasting until I got the saltiness the way I wanted it. At the very end, I tossed in several sprigs (just the top 2 or 3 sets of leaves) of various basils - 3 or 4 sprigs of Thai basil, 2 or 3 sprigs of 'Mexican Cinnamon Spice' basil, 2 sprigs of 'Sweet Petra Dark' basil, and 3 or 4 sprigs of lemon basil. I expected this amount of food would serve 2 with leftovers, but we ate it all! And it would have been fine without the Bellingrath Gardens Hot Purple peppers, but with them it was incendiary - just the way we always ask for it in Thai restaurants and hardly ever get. Oh yeah, I should also mention that it took a long time with the range fan, ceiling fans, and open windows before the chile fumes cleared out of the house, but we dined on the deck and it was a nice evening to have an after dinner glass of wine outdoors. Tuesday's gazpacho (below) was served with fancied-up pepper and egg sandwiches. I think soups and sandwiches just automatically go together, although sometimes I just serve soup and bread (not as austere as it sounds). Sliced into long strips (about 1/2 inch wide) one and a half green bell peppers and some mixed (mild and hot) New Mexico style red peppers. Sliced half a yellow onion lengthwise, and a clove of garlic crosswise. Heated some olive oil in a non-stick skillet over fairly high heat and sauteed the vegetables quickly, so the peppers were cooked through, but not limp and soggy. Lowered the heat and stirred in 3 beaten eggs. Cooked until set, seasoned with salt. Then (here comes the fancy part) I split and toasted some squares of La Brea Pain Rustique, drizzled a small amount of leftover Rosemary/Garlic-Flavored Olive Oil on the bread, and arranged the peppers and eggs into a sandwich. This turned out really well, and it was serendipitous. Trying to clean out the fridge, spotted the leftover flavored olive oil, and thought "Hmmmm..."
I never really liked gazpacho in its original form. Tomato puree thickened with bread is a waste of bread and tomatoes, if you ask me. But the gazpacho at L'Auberge Chez Francois is a very different thing, and I always order it when it's on the menu. (We don't go there very often - it's been our Occasion Restaurant for many years.) Their gazpacho is more like a slightly chunky version of V-8 juice. The recipe is in The Chez Francois Cookbook, but I've adjusted it to suit our tastes. For us, this amount serves 2 with leftovers. How you get the fresh tomato puree is up to you, but I just bought a food mill, and I think that's the way to go. I cut up some very ripe Striped Roman tomatoes and put the pieces in the food mill, mashing them slightly so the food mill could do the rest. A few turns of the handle, and you have perfect fresh tomato puree. Mash 1 clove of garlic with salt in a mortar and pestle. Or you could just put it in the food processor in the next step, but the mortar and pestle will give a smooth paste. I realize that if you're not growing your own, the last two peppers are going to be difficult to obtain. I think you could substitute a very small amount of any fresh hot chile pepper, to your taste, or leave them out entirely. Add the tomato puree and the mashed garlic to the food processor and pulse a couple of times, just to blend everything. Remove the mixture to a bowl, and stir in by hand: salt to taste (I use something less than a teaspoon; the original recipe called for a tablespoon), 1 teaspoon or less red wine vinegar, several tablespoons of olive oil, and a small amount of freshly ground black pepper. Taste and add more salt if needed. I had to add a tiny bit of sugar to this because the tomatoes were tart and the teaspoon of vinegar pushed it too far.